Sous vide……..What a Great New Way to Cook! The holidays are always greatly anticipated at our house, especially when we are privileged to host our family and friends. We go into high gear – and this year, it was even more fun than usual. A couple of weeks ago, a new-found friend had been explaining a cooking technique he used. It was called sous vide. What??? How do you spell that? It's French, pronounced “soo veed” and it means “under vacuum”. After our friend's animated description, we looked at each other and decided we just had to check into this technique a bit further. Off to the Internet we went, reading different recipes and understanding the whole concept of this type of cooking. The sous vide technique cooks your food in a vacuum sealed bag while it is submerged in a water bath at a precisely controlled temperature —- whew! That's a mouthful! In a nutshell, you take your piece of meat, for example, and place your favorite spices, fruits, and/or rubs inside the bag. Vacuum seal the bag closed and submerge it in the sous vide cooker. It is preset to a special temperature and the cooker will hold water within one degree of that temperature for the entire period of time it cooks. The natural flavors and juices are locked inside the bag as it cooks. The nutrients found in the food are retained – compared to grilling or baking, where they may evaporate or stay within the pan. 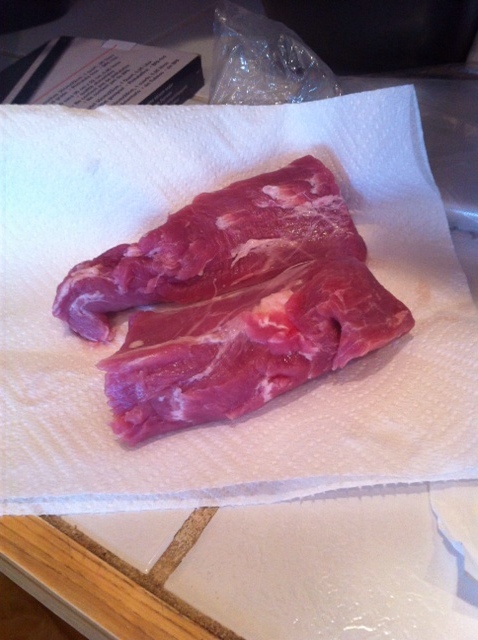 The time and temperature that you cook your meat varies. We did a brisket for 48 hours (yup, you heard it right!). Beef tenderloin – 4 to 6 hours. Pork tenderloin took 6-8 hours and salmon was done in fifty minutes. 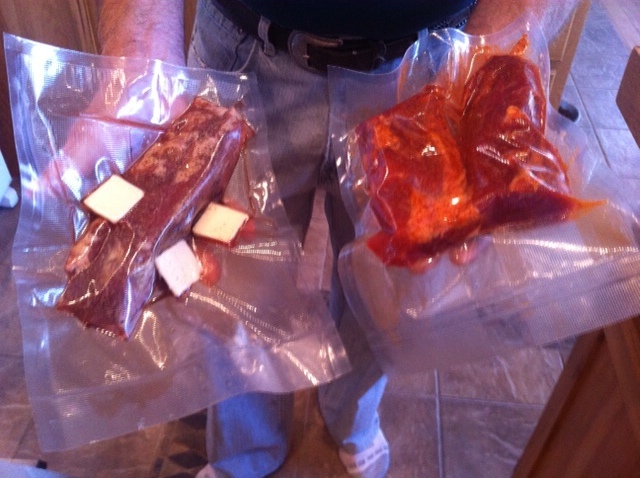 Each cut of meat was sealed in it's own bag with it's own variety of seasonings. The low, slow way of cooking made the meat OH so tender and moist. We chose to purchase a sous vide cooker, but have been told that you can make your own by purchasing a heating element and circulator on-line. I will tell you that the cooker, itself, was pricey – but we seldom go out to eat and I would liken the price to a fancy dinner out for four. The water temperature and the cooking time determine the “done-ness” of the food – so special attention was given to the cooking manual! Not to be outdone by the main dish, we had to have some homemade Thanksgiving bread to complete the look. 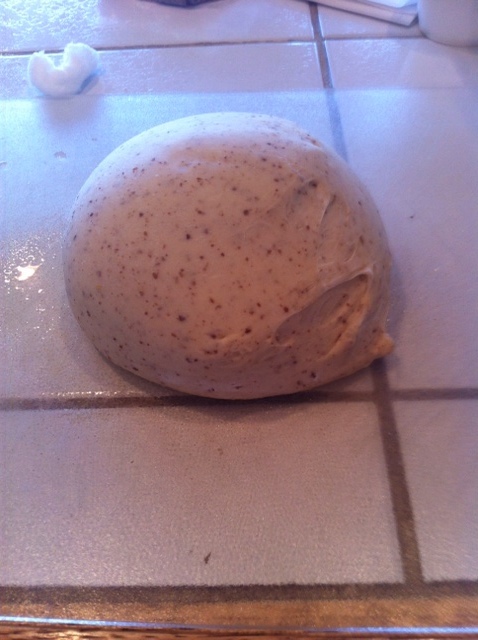 We made a batch of dough, shaped the rolls into balls and scored the sides with a sharp knife. 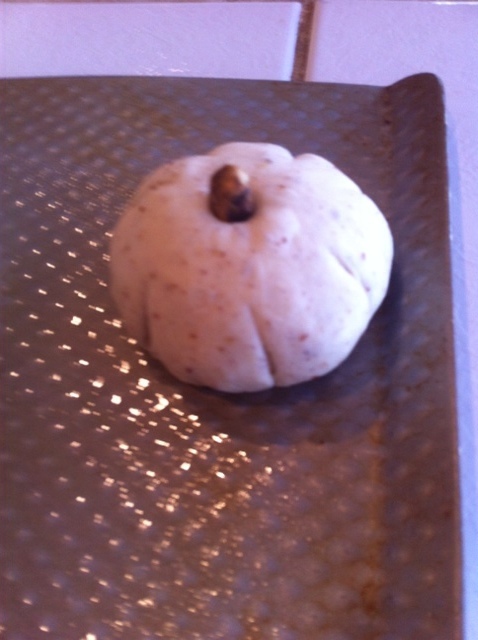 As the dough rose, it spread apart and gave the appearance of a little pumpkin. 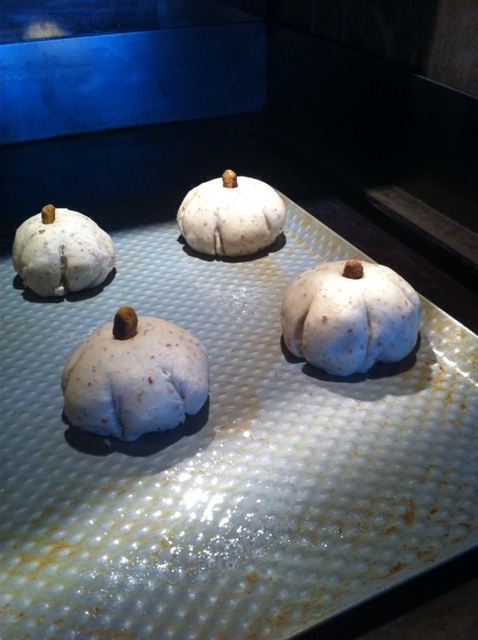 We stuck a nut in the top to give it a stem – and off to the oven they went. 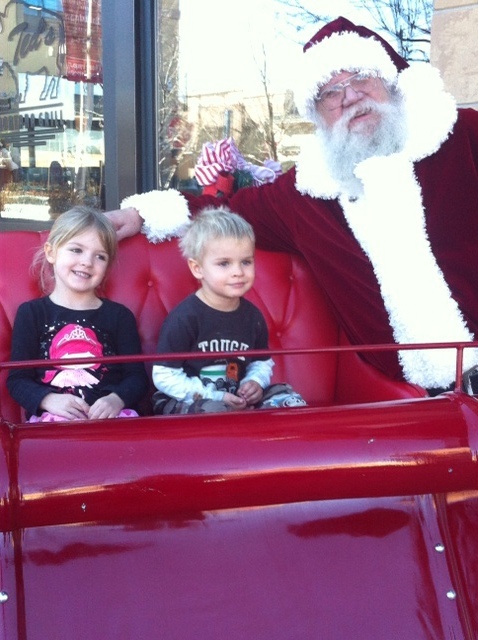 After a wonderful day of great family, friends, and food – we paused to say “thanks” for another holiday….and bustled off to the car to go see Santa!! 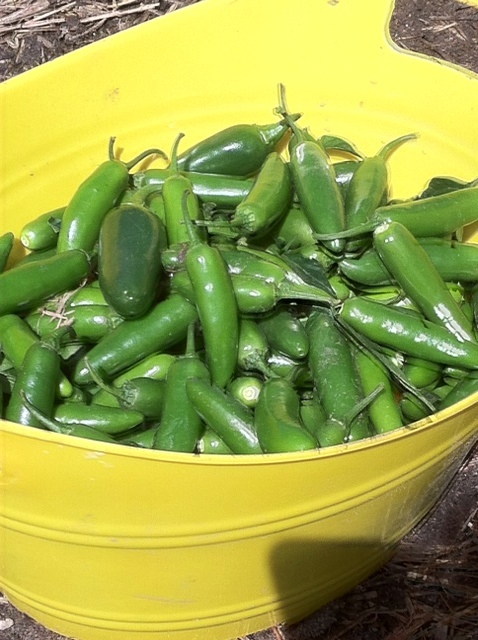 It was an idea that I had been brewing all year – having a farm-to-table dinner with the bounties of the ranch. Boy, did we have fun! We invited friends from our neighborhood to join us for the fixings. For two days before the party, we gathered and chopped fresh fruits and vegetables. Our evening started with cherry tomatoes stuffed with mozzarella and basil and a charred corn and avacado dip. Baked potatoes and homemade bread (yup, Mom's recipe from my blog earlier this year) coupled with our grassfed beef smoked to perfection. One neighbor accepted a “throw down” challenge with the beef, and he and Kevin each prepared their prime rib and New York strip roasts with their own secret seasonings and techniques. Fresh corn on the cob was mouthwatering, and the watermelons were ready for the picking. We finished off our evening with apple crisp and strawberry rhubarb crisp. Many enjoyed our homemade wine with the meal. I'd love to share one of the appetizer recipes – it's a hodge-podge of garden veggies that is light, colorful and healthy! Remove the silks from the corn, soak in water for 10 minutes and then place corn on a hot grill for 10 minutes, rotating several times. Cool and remove the kernels from the cob. (note: I have made this several times when corn on the cob was not in season. I simply cooked the frozen or canned corn on the stove in a pan with a bit of EVOO). 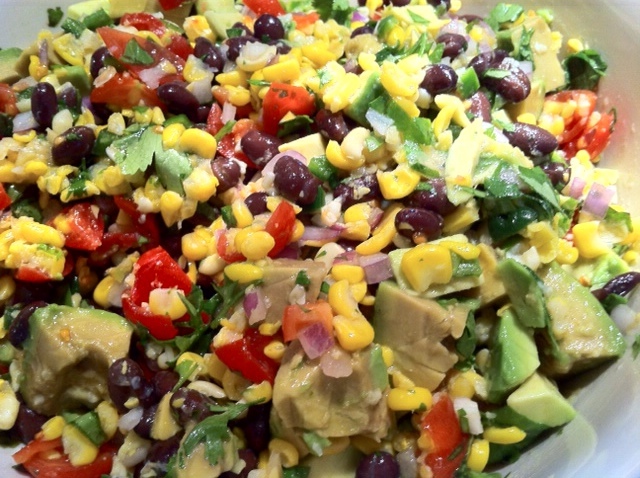 Combine all of the remaining ingredients and refrigerate for one hour before serving. When I get a “hankering” for some delicious seafood, my favorite way to prepare it is with the following recipe. Gone are the days in our household where deep fried shrimp is served. THIS recipe is not only delicious, it is quick and easy to prepare and has a low calorie count (190 calories per serving). It works on all kinds of white fish – halibut, cod, and mmmmm – walleye. Give it a try! In a small saucepan, melt your butter and stir in the bread crumbs, garlic and Parmesan cheese. Remove from the burner and cool. Shell and devein your shrimp; cut through lengthwise until almost split. Flatten and place in a single layer in a medium sized baking pan. Spread each shrimp with a scant tablespoon of the crumb mixture. Bake 15-20 minutes at 375 degrees until shrimp are tender. The shrimp come out of the oven with a wonderful garlic, cheesy flavor with a slight breadcrumb coating and boy, they are good! A couple of months ago, I read an article about bread crumbs. Yup – not all breadcrumbs are created equal! I enjoy making my own bread, but there are times when you don't get to the end of loaf fast enough and the bread gets kind of dry. I just pop the slices on a cookie sheet and let them totally dry out, then hit then with a rolling pin to make my own bread crumbs. They are great for this recipe. The article I read on bread crumbs told me that the package you purchase in the store of your favorite bread crumbs is perhaps more than you bargained for. So, last time through the grocery store, I had to see for myself. 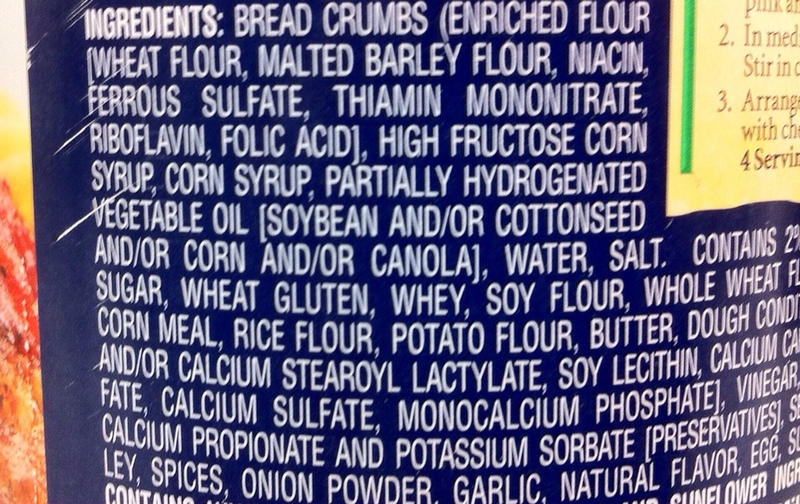 Here is the list of ingredients on the back of one particular bread crumb container. I will continue to use my “day old bread” for breadcrumbs. Who knew? My memories see rows of ripe, red raspberries, plump peas hanging from the vine, and baskets of freshly dug potatoes. 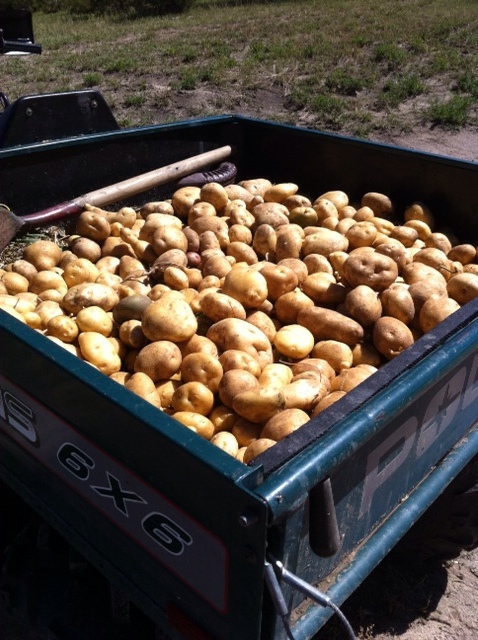 Lots of potatoes. Growing up in the midwest in a Scandinavian family, potatoes were a staple. My Dad loved them for breakfast, lunch, and dinner if my Mom would fix them for him. Food was harvested from the land whenever possible, whether it be from the garden, fresh venison or grouse, fish from the “Land of 10,000 Lakes”, or picking wild blueberries in the woods. The food was fresh, and OH, so good! I barely remember a box food besides my favorite breakfast cereal. It’s clear that, as the generations unfold, many ways are forgotten or lost. My Mom gave me the recipe for her bread years and years ago. It was handwritten on a small piece of paper, and the heading on the paper read, “Good Luck”, I think more in keeping with my ability to make the bread than this bread being called the good luck bread! Her ingredients weren’t exact, but were written to say things like “add flour until it feels like”, or “scald the milk, but don’t boil tho”. The scrap of paper with my “Good Luck” bread followed me and my family for years from house to house always stuck in the recipe box – but one day, it was gone. I tore through my collection of recipes, frantic to find the paper. Nowhere! You’d think after years of preparing this bread, I could recite it by heart, and to that end – yup, I almost can. But I still looked for it, hoping to this day to see that slip of paper with Mom’s handwriting on it. So, before it gets lost again in another shuffle, here’s our “Good Luck” bread recipe. I use my breadmaker for this recipe – setting the machine on the ‘dough’ cycle. Always put your wet ingredients in the bottom of the breadmaker pan first – followed by the dry ingedients. As the dough is getting mixed, lift the lid on your breadmaker just to feel the consistency of the dough. Add a little bit of flour if it feels too sticky, or a little lukewarm water if it feel too dry. You’ll want it to mold easily, but not stick to your fingers. When the dough cycles is finished, let it rise until you can poke the doughball with your finger and the hole remains in your dough. Mom often made “finger rolls” from this recipe – and it was a favorite around our house for sure! Cut your dough into eight (or so) equal pieces and shape each portion into a “finger” laying each side by side in the pan.